Back then in 2008 when Rock On 2 had released, it had a very modest start of a little over 1.5 crore. This was the first ever mainstream Bollywood film centered on rock music and audiences took time to warm up to it before giving it a nod of approval (in select centers). Now that the film’s sequel is coming, there is good benefit of the recall value as the story has stayed on over the years. Moreover, every six months, there was some or the other talk around the film that helped it stay in news over the years even when it hadn’t gone on floors. Now that the film is ready to release, it is expected that the first day opening would be in 4-5 crore range. In absolute terms these may be just about decent numbers but in relative terms, this is still triple the number of first day collections of Rock On, which isn’t something that the makers would mind. Farhan Akhtar’s last release Wazir had an opening day of 5.57 crore while Shraddha Kapoor’s Baaghi had a start of 11.94 crore. In that aspect, anticipated opening of Rock On 2 may seem low. However, one has to consider the genre of the film and in that aspect, 4-5 crore could well be a decent start. 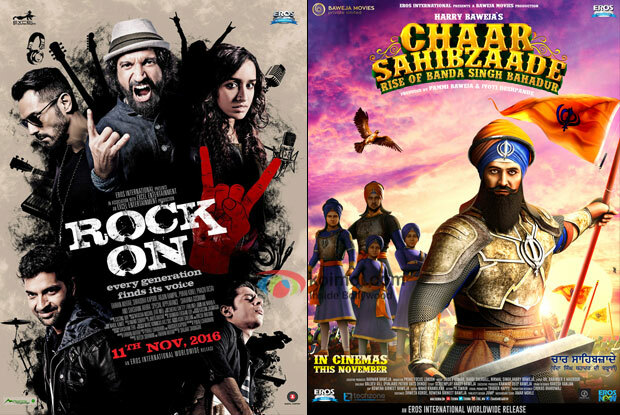 Second release of the week is Chaar Sahibzaade – Rise of Banda Singh Bahadur and just like Rock On 2, this animation film too has Eros associated with it. The film would be mainly arriving in the North belt and see a concentrated release in Punjab and Delhi NCR. This is where the first in the series, Chaar Sahibzaade, had done quite well and that too solely on the basis of very strong word of mouth. Now the makers are expecting similar outcome for the second part too if one goes by the minimal promotion that the film has seen on conventional mediums. Dongri Ka Raja, by the very title, suggests that it would mainly see a release in Mumbai region. On the other hand Yeh Hai Lollipop has Om Puri as its biggest face on the poster and would see a very sparse release.